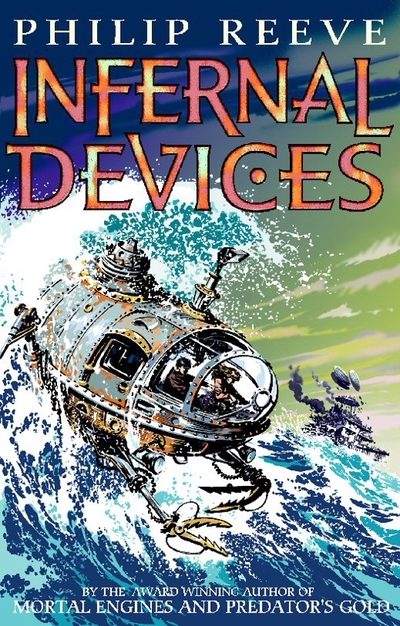 One of the biggest questions people will ask about Infernal Devices is ‘is it better than Mortal Engines and Predator’s Gold?’ The answer is no. Infernal Devices is not another step up, but rather a small step down. For, although it would make quite a neat book as a standalone, as a continuation of the series it is not as good as it’s predecessors. It’s a shame really; Infernal Devices could have been quite an adventure, but alas, it is not so. The story, for one, is quite similar to Predator’s Gold in that it is more of a journey; following Wren from Anchorage right through to Brighton. This linear story line makes the beginning quite bland and the end quite exciting (although I reckon the opening paragraph or so is quite encapsulating, but more on that later). Plot points are also quite predictable, and don’t really come as a surprise to the reader, either, and the plot in itself isn’t too complicated. When written on paper, it is quite simple, actually, and thus it isn’t the greatest of Reeve’s works. Character-wise, we focus on Wren, who is Tom and Hester’s daughter of fifteen years, who you may have read was conceived in Predator’s Gold. Although the relationship between Wren and her parents is interesting, her character is otherwise quite bland, much like Tom’s. As a replacement for Tom and Hester, she doesn’t work as well; and we’re left with a gap, where normally the main characters would be. As a reader, I was yearning to see Tom and Hester in this rather than Wren, and that is a major off put. Theo and Wren also seem a lot like a rip off of Tom and Hester, albeit not having Hester’s personality. It just seems like Reeve has recycled them and given them new names. As such, it was also relatively easy to guess that a romance was going to form (don’t worry, you would have worked it out fairly early on). I also found Tom and Hester to have changed slightly… I certainly did not find the speech to be that of thirty-odd year olds, but more like what they were in book one and two, and it would be hard to distinguish had we not been told that they were now in their late thirties. I mentioned earlier the fact that I rather enjoyed the opening paragraph of Infernal Devices; and although it wasn’t as lovely as in Mortal Engines, it is still a much more captivating first few sentences than Predator’s Gold was. The first sentence, particularly, reminded me of the Biblical creation story, which is what Reeve wanted to achieve, I suppose.